FRAMINGHAM, Mass., November 1, 2018 – According to preliminary data from the International Data Corporation (IDC) Worldwide Quarterly Mobile Phone Tracker, smartphone vendors shipped a total of 355.2 million units during the third quarter of 2018 (3Q18), resulting in a year-over-year decline of 6.0%. This was the fourth consecutive quarter of year-over-year declines for the global smartphone market, which raises questions about the market's future. IDC maintains its view that the market will return to growth in 2019, but at this stage it is too early to tell what that growth will look like. While the overall smartphone market has declined for four straight quarters, two things stand out as major factors in the third quarter. Samsung, the largest smartphone vendor in terms of market share, accounting for 20.3% of shipments in 3Q18, declined 13.4% year over year in the quarter. And secondly, China, which is the largest country market for smartphone consumption, accounting for roughly one third of global shipments, was down as well for the sixth consecutive quarter. Samsung had a challenging quarter with shipments down 13.4% to 72.2 million units shipped. The market share leader continues to feel pressure from all directions, especially with Huawei inching closer to the top after its second consecutive quarter as the number two vendor. In addition, growing markets like India and Indonesia, where Samsung has held leading positions for many years, are being changed by the rapid growth of Chinese brands like Xiaomi, OPPO, and vivo. Meanwhile, China’s domestic market, which represents roughly one third of all smartphones consumed, has been in decline since the second quarter of 2017, and 3Q18 was the sixth consecutive quarter where the market sees contraction. China was down 11% in the first half of 2018 (1H18), and the challenges continued into 3Q18. Overall IDC expects this decline to decelerate with the market returning to flat growth in 2019. "China's domestic market continues to be challenged as overall consumer spending around smartphones has been down," said Ryan Reith, program vice president with IDC's Worldwide Mobile Device Trackers. "High penetration levels, mixed with some challenging economic times, has slowed the world's largest smartphone market. 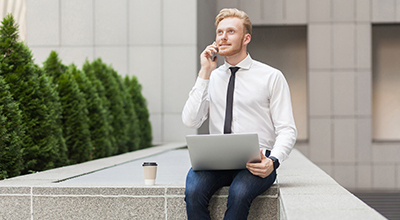 Despite this, we believe this market will begin to recover in 2019 and beyond, driven in the short term by a large, built up refresh cycle across all segments, and in the outer years of the forecast supported by 5G migration." 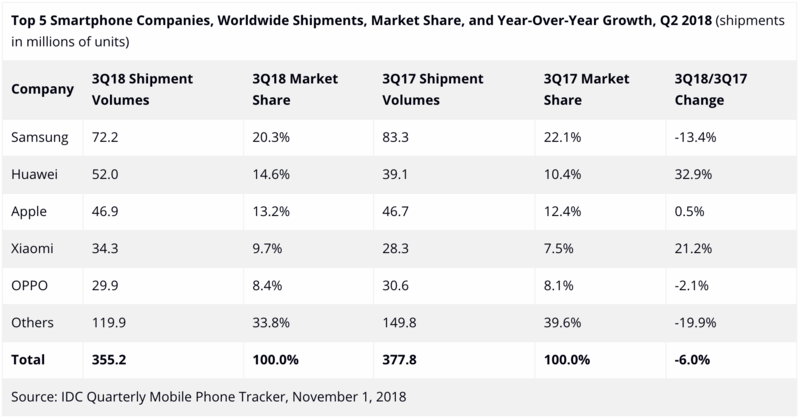 "The race at the top of the market continues to be a heated one as Huawei once again slipped past Apple to the second position," said Anthony Scarsella, research manager with IDC's Worldwide Quarterly Mobile Phone Tracker. "Although Huawei may have beat out Apple in Q3, the holiday quarter could have Apple as the market leader thanks to the launch of three new bezel-less devices. No matter who leads in the overall market the holiday quarter should be an exciting one with a wide selection of new flagship devices available. With the new iPhones, Mate 20, Pixel 3, V40, Note 9, and OnePlus 6T, we can expect consumers will have a plethora of options when upgrade time approaches. The vast selection of high-priced handsets should move ASPs in a positive direction come next quarter." Samsung had a very challenging quarter with smartphone shipments down 13.4% from 3Q17, with overall volumes of 72.2 million. While this was still enough to maintain the top market share position, the company does continue to lose share. The launch of the Galaxy Note 9 was successful and the device continues to build in shipments. However, Samsung's bigger challenge is the ground they are losing at the mid-range and low-end. Recent announcements of revamping the product portfolio to bring new features and awareness to non-flagship models could possibly help this slide. Samsung will most likely look to new A-Series devices to fill the gaps left in the mid-tier across numerous markets. Huawei landed in the number two position for the second straight quarter. While its share was down slightly from last quarter's 15.9%, overall the company should be pleased with shipping 52.0 million handsets and grabbing 14.6% of the overall market. From a product perspective, its P-series and recent update to its Mate-series are keeping it as competitive as ever at the top of the market. And its Honor brand, which is primarily marketed toward a younger audience and online sales, has continued to do well in many markets. Apple's newest iPhones helped push third quarter shipments to 46.9 million units, up 0.5% from the 46.7 million units last year. Apple once again launched three new devices at its Fall event, as the new 6.5-inch iPhone XS Max and 5.8-inch iPhone XS were joined by the more affordable iPhone XR in the Apple line-up. The new XS Max and XS continue off the success from last year's iPhone X but bring a new screen size option with more power and increased performance to the table. And Apple has once again improved the camera, upped the storage, and added a new faster processor via the A12 Bionic chip, which is the first 7-nanometer chip for Apple. Older iPhones, such as the 6S, 7, and 8, all received price cuts late in the quarter, which will balance the iPhone portfolio across all price tiers for the holiday quarter. The older SE and iPhone X from last year have been dropped from the Apple line-up. The fourth quarter will include shipments for the vastly popular iPhone XR, which have not been counted in IDC's Q3 figures. Xiaomi once again grew its share to a new company high capturing 9.7% of all smartphones shipped worldwide in 3Q18. Xiaomi continues its global expansion with market share gains in countries where it has been growing it presence, including India and Indonesia, and making headway into European markets like Spain where it continues to cause disruption. Its Redmi 5A, Redmi 5 Plus, and Redmi Note 5 have continued to do well, with the newer Redmi 6/A/Pro successors ramping up quickly. OPPO like Samsung saw shipments decline year over year, although on a much smaller scale. Despite that, OPPO remained the number 5 vendor in terms of market share with 29.9 million shipments in 3Q18, down 2.1% from a year ago. Like a few of its competitors that continue to climb the smartphone ladder, OPPO is beginning to gain global attention for some of its newer flagship devices that have come with highly marketed launch events. Designs on the Find X and R17 products are raising the bar for OPPO, and in return they are continuing to see their user ASPs increase.